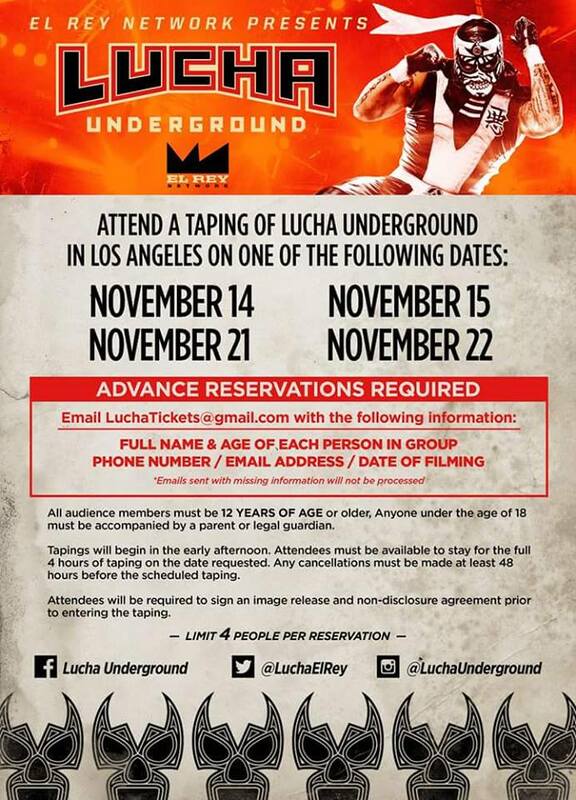 The second season of Lucha Underground TV Tapings are scheduled and you can now make your advanced reservations for the taping. They are only accepting ticket requests for the first four tapings. No children under the age of 12, all children under the age of 18 must be accompanied by an adult. The First four tapings are November 14th, 15th, 21st, and 22nd. When requesting tickets you have to have the name and age of each persin attending as well as include your phone number, email, and the date you would like to go. Tapings will begin early in the afternoon and will last 4 hours. All attendees must be available to stay for the full 4 hours of taping. Any cancellations must be made at least 48 hours before the scheduled taping. All in attendance must sign an image release and a non-disclosure agreement prior to entering the event.